Novelty: In Karnali's first ever performance of conceptual minimal art, performers moved from one end of the town to another with painted faces and bodies, writing with chalk on the asphalt and rolling on it so the writing transferred to their bodies. They expressed their experience of Karnali and spread awareness about the hazards of junk food and plastic. It is no secret that Nepal is one of the photogenic countries in the world. Picturesque Nepal is also reflected in paintings, and Phewa and Machapuchre make it to many canvases in Thamel. However, despite its pristine beauty, Rara never makes it to any oil-on-canvas work. That is because Rara is in Mugu, in Nepal’s most remote districts. It takes at least two days just to get to the lake from Kathmandu — and that is by plane. Surprisingly, it takes about the same time by long-distance night bus. Which is why artists never really go there. However, 14 fine art students and their teachers braved the precarious journey to hold a five-day workshop and Karnali’s first-ever modern art exhibition in Gamgadhi of Mugu. The paintings captured a wide range of natural and cultural aspects of Karnali, including Rara lake, Chhayanath temple in Chaina village, and lifestyle of the surrounding villages. 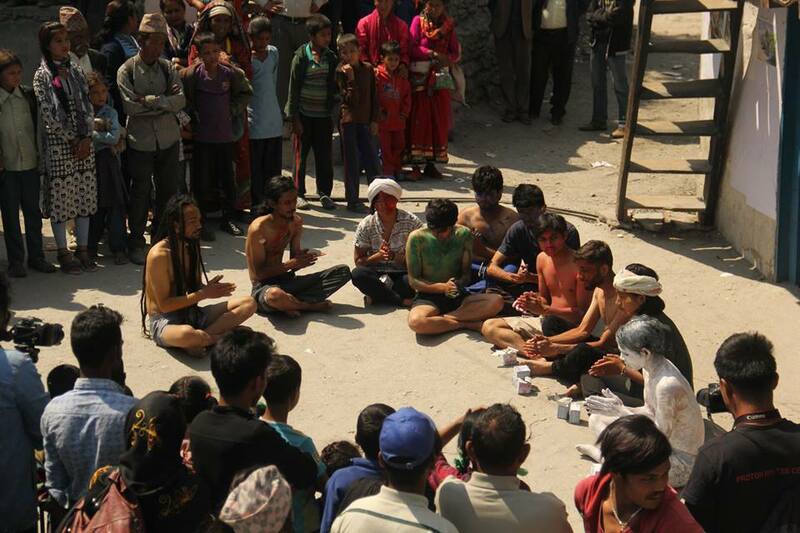 Local residents looked on with amazement as the artists staged a performance representing their experience of Karnali: they moved from one end of the town to another with painted faces and bodies, writing with chalk on the asphalt and rolling on it so the writing transferred to their bodies. Hamal and the Karnali Arts Center (KAC), which organised the event, also intended to get children interested in art, inviting over 2,000 students from 5 schools to the exhibition. Not only did children watch the paintings and performances with curiosity, but their parents also understood art as a career. Mugu has been a hub of modern art in Karnali of late, starting a decade ago when youngsters from the district entered Sunil Pokhrel’s Aarohan Gurukul to learn theatre, and created memorable dramas including Karnali Dakkhin Bagdo Chha. Local artists credit Min Bham, a member of that generation, for opening the doors to modern art for Mugu. While Bham went on to gain international success with his first movie Kalo Pothi, very little of Mugu’s engagement with modern arts has gone back to Mugu itself, with local residents unaware of modern styles of painting.